Are you struggling with brain fog and looking for a solution? While I’ve found changing my diet to be 80% real foods and incorporating a few well-researched supplements for brain support effective, I use essential oils to quickly beat brain fog. There are many reasons people experience what’s commonly referred to as brain fog. It can be caused by anything from a bad night’s sleep, an allergy to certain foods, or something more chronic and problematic like an autoimmune disease. You can learn more about the top causes of brain fog over here. Regardless of the cause for your brain fog, there are some essential oils for brain fog that can help you achieve clarity, focus, and a little boost of energy. Peppermint oil is often used for people with migraines or tension headaches – it’s actually my go-to oil for this! Applying a little on my temples or the back of my neck gives me relief. This same oil can be used to improve mental clarity and focus as well. It lifts brain fog. Since peppermint essential oil can open up your airways, you may also find that it gives you a boost of energy as well without a stimulant like caffeine. That makes it the perfect essential oil to use for your afternoon pick-me-up or commute home. I find peppermint is one of my most used essential oils, and I share even more uses of this versatile oil in my free upcoming webinar, Top 10 Essential Oils. Click over here to get registered. Rosemary oil is commonly used to help improve memory and cognitive function. If I have a big project that requires me to think clearly and focus, rosemary oil is a good go to in the diffuser or topically. Have you ever just gone up to a rosemary bush, rubbed the plant with your fingers, and taken a deep breath? It has a pleasant and powerful aroma! That makes it a perfect essential oil for focus and clarity. You may be surprised by this stimulating aroma. It’s not always a commonly used essential oil or really my first go-to essential oil. But when it comes to brain fog or poor memory – it’s a must! It has both energizing and restorative properties to give you almost instant energy and can help give you the brain boost you want. When focus is important, basil essential oil can improve concentration and boost alertness. If you’re feeling mental fatigue or even physical aches, it’s another great oil to use. Ok – I’m cheating here…I wanted to just give you seven essential oils for brain fog, but there are several citrus scents that can work well as a mental pick-me-up or brain fog buster. These include: red mandarin, wild orange, lemon, bergamot, and grapefruit. All of these citrus oils (and even a few more) are good for emotional and mental pickups. They can make you feel more mentally alert and energetic – and totally change the tone of your day. I like to call them my “positive vibes” oils. Eucalyptus oil has the power to increase blood flow to the brain and target inflammation. Check out this study to read more. Similar to peppermint, eucalyptus can open up the airways which gives your body more oxygen. It can be even more effective as an essential oil for brain fog when it’s combined with other essential oils on this list like bergamot, rosemary, and clary sage. Another surprising essential oil for brain fog, clary sage has been shown to improve memory, clarity, and focus. Clary sage is actually one of the most multipurpose essential oils out there behind frankincense (the king) and lavender (the queen). It can be used alone or blended with other essential oils to help clear brain fog. Watch out – you may also experience digestive and hormonal support as a ‘side effect’ of using clary sage oil. Nothing like pulling out an oil from left field, right? Juniper berry has some exceptional purifying and cleansing properties and health benefits - including its antibacterial properties. However, when blended with citrus oils, it serves as good mental energy and focus booster to help you beat brain fog. Another favorite use of this oil? I love using it in the diffuser at night or as a ‘Monster Spray’ for my little one. It works great for keeping bad dreams away. There are many ways to benefit from essential oils for brain fog. You can put a drop on your palms and inhale, dab some on your wrists, or use a few drops in a diffuser. You can also create your own bust brain fog essential oil blend by combining a few drops of the oils on the list. Below, I’ve included two of my favorite blends – one for a roller ball blend and one for your diffuser. Sometimes you need a ‘quick fix’ or on-the-go essential oil blend. 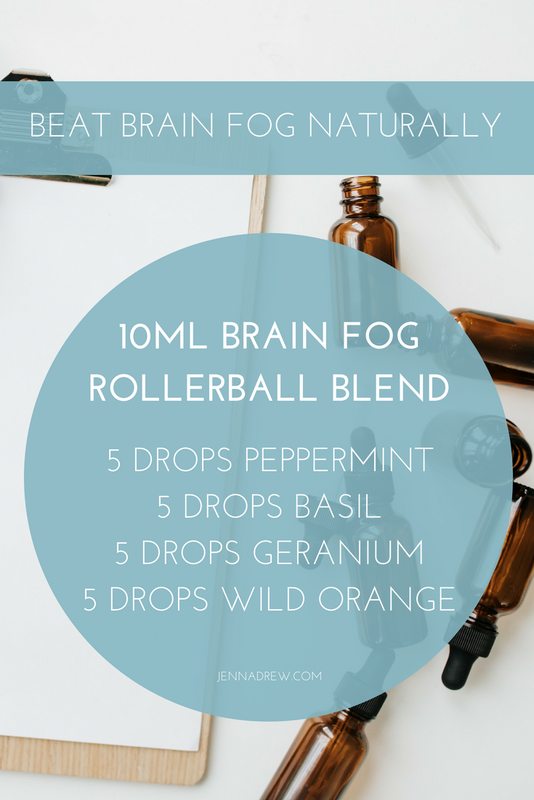 This rollerball blend to beat brain fog works great before you step into an important meeting, while you’re working on a big project, or when you simply just have one of those bad brain days – you know like the kind where you walk into the next room and forget why you’re there. Diffusing is the perfect way to affect your mood and emotions. This can really be beneficial when it comes to improving memory and mental alertness. You’ll need your cool-mist diffuser, some water, and your essential oils. Then fill it up to the fill line with water. We are all a little different chemically, so different oils work for different people – even for the same support. Test a few of these essential oils to see which one(s) work best for you and improving your mental sharpness. P.S. I’ve got an upcoming webinar on essential oils! Click here to register for the top 10 uses of essential oils.